Japan-based Eco Marine Power (EMP) says it expects that its wind and solar power marine propulsion system will produce at least 10 percent bunker savings, or around 1,000 metric tonnes (mt) per year for a typical large commercial vessel. The development of EMPs Aquarius MRE system has been well documented in these pages, but as the system gets closer to being a commercial reality its potential is becoming clearer, EMP's Greg Atkinson told Ship & Bunker. In a world of often "too good to be true" bunker saving claims, Atkinson says the 10 percent savings are actually a conservative estimate. "In the past one problem has been that people promoting sail technologies have been in a race to the top as far as claiming fuel savings from sails. This sort of talk doesn't help promote the use of renewable energy on ships, instead it just makes people sceptical," he told Ship & Bunker. When we remember that for the majority of their history ships operated on 100 percent renewable wind power for propulsion, it's easy to see why "potential" savings can easily be touted to be as much as 100 percent. In the real world, Atkinson says taking into account practical considerations for such systems designed to be used on today's vessels, then this is simply not possible. "In theory you could just make the sails very large and potentially the fuel savings would be increased. However our focus is on safety and so we don't feel rigid sails that are for example 30 or 40 metres high each are practical for RoRo ships, bulk carries, cruise ships, large car/passenger ferries and tankers," he said. Even so, Atkinson says a modern vessel designed specifically with EMPs technology in mind could more than double that 10 percent bunker saving. "Theoretically if a large ship was specifically designed to use Aquarius MRE (wind and solar power) and operated on a route that had good wind conditions then I'd estimate the fuel savings to be up to 25 percent," he said. But even at 10 percent savings, a large ship using 40 mt per year at sea for 260 days a year would save around 1,040 mt of IFO380 per year. That reduction would also mean CO2 savings of 3,239 mt and SOx savings of around 23 mt per year. To get an even clearer idea on what the real-world savings will be, Atkinson says EMP will co-operate with two major shipping companies in a study to calculate the potential fuel and emission reductions through the use of wind and solar power on some of their ships. Consisting of a research study and evaluation voyages, the first phase of the study is expected to commence this month. Another point Atkinson stressed was that while some of the latest bunker saving tech, such as its rigid sail technology, may seem radical, it typically already has a history. "I believe it's important to acknowledge the efforts of others in the past. 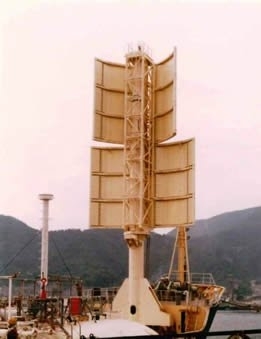 For example some JAMDA sails were foldable in segments and yet there are those who claim that folding rigid sails for ships is a 'new idea'," he said. "The same goes for wing sails for ships whereas in reality the WalkerWing Sail was on the MV Ashington back in the 1980's. Even the use of solar cells on sails is not new and a US patent was applied for in the 1990's and this included traditional soft sails with PV cells."